Apple has done a pretty good job with the Dock in MacOS. There is just one thing that I do not like though; the way it stacks icons when you add a folder to your Dock. A smart guy from Japan (2007 – Yasushi Chida) actually came with a neat idea for that, by introducing “buckets” (or better said: Stack Overlays) placed over the folders in your Dock. All that without the need to install any extra applications! Unfortunately, his website at Yahoo!/Geocities has been gone for quite a while now. The few steps you have to take can be a little bit challenging for MacOS beginners (even though it is pretty easy – as usual; once you know how it works). So in the article I’ll show you how to use buckets (a.k.a. Stack Overlays) in your MacOS Dock. This seems to work as of MacOS X Leopard and still works in Mojave (and I do expect this to work in future versions as well). 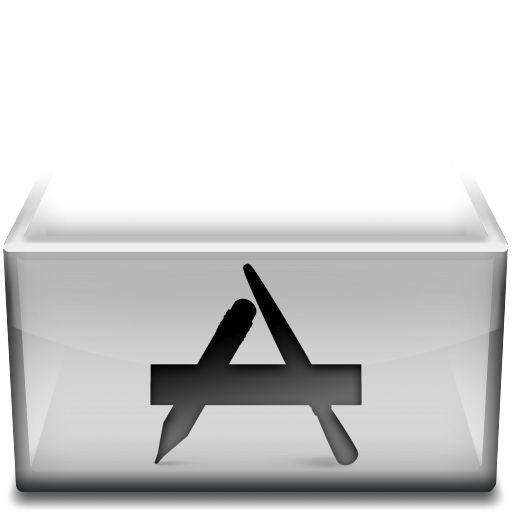 What is a Stack in the MacOS Dock? A “Stack” is in essence a shortcut in your Dock, to a directory (folder) on your Mac, represented as a “stack” of icons. In the following steps, we will illustrate this by using the “Applications” directory, where all your applications can be found, for much easier access to your Applications. You can of course do this with any folder/directory you’d like. The easiest way to add a folder to the Dock, is by dragging a directory/folder from the Finder, onto the Dock. For the “Applications” folder; in Finder (does not seem to work in PathFinder!) you can drag “Applications” from the favorites onto the Dock and drop it there. 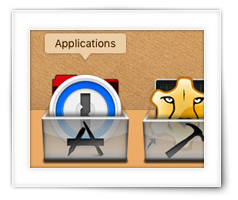 A “stack” of icons will now be displayed, representing your “Applications” folder. When you click on this “stack”, all your applications (in the Applications folder) will be shown, either in a grid, fan, or list. Note : Again, you can do this with any directory on your Mac, here we just use the Applications folder for illustration purposes, as this is probably the most common one to add to the Dock. Now notice how the icon is shown in the Dock. 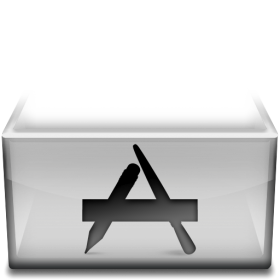 To represent the “stack” in the Dock, a compilation (or “stack”) of the icons of applications and/or files in that folder is shown (the Application folder in our previous step). They are stacked in a certain order, something you can define per individual stack that is placed in the Dock. In this example, stacked alphabetically with the first icon on top. Right click the stack in the Dock and you’ll see a menu appear allowing you to determine appearance and sort order. I recommend playing a little with the different settings to get a feel for it. Icons are Sort by name, the stack is Displayed as a stack in the Dock and the Content is viewed/displayed “Automatic“ (in my case it would show as a “Grid”). The idea behind dressing up a stack with a so called overlay, is based on the fact that icons of files and/or applications in that particular folder are “stacked” (placed on top of each other), and the fact that MacOS icons can be transparent. Since the “stacked” icons are sorted alphabetically, you can see above, in figure 2, that the icon of “1Password” is on top (“1” comes before “A”). Now to make an overlay, we’ll need an icon, say one that is transparent mostly and kinda looks like a bucket. As for the file format for an icon, you could use the “icns” file format if you want to create them yourself. However, you do not need to worry too much about this, since there are quite a few icon collections out there that can be used for our purpose (see “Download Stack Overlay Icons” below). A Japanese designer, Yasushi Chida’s, has created some really nice looking buckets for this purpose – unfortunately his website at GeoCities/Yahoo is down and his Deviant Art page is empty. Below an example of one of the buckets he created. You can see the transparency at the top opening of the bucket. The edges of the bucket itself are NOT transparent and this is done intentionally so it will “cover” the other icons. Yet at the top, the other icons will be visible since the bucket icon is transparent in that area, and appear to be “in” the bucket. 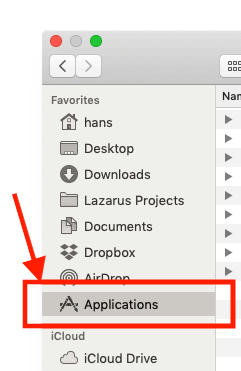 If we would add such an icon file to the folder we are working with (“Applications” in our example), it would simply be added to the stack. Depending on it’s name it would be somewhere between the icons in the stack. Now if we would give the icon have a filename that starts with a character that would always sorts alphabetically as the first file in the list, then it would become the top icon. Which is what we would want. Alphabetically, a space seems to come before anything (you can see this for example in our ASCII list). Usually files or application names do not start with a space. So if we name the icon file, starting with a space, it will always show on top. 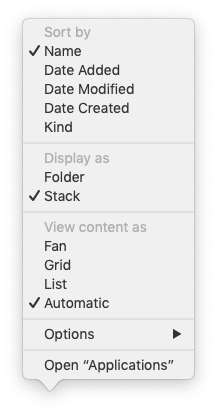 Set the “Display As” option to “Stack” – if you would set this to “Folder”, then a simple folder icon would be shown instead, which would not work with our Stack Overlays trick. Make sure the “Sort by” is set to “Name“, besides the obvious practicality of it (searching for files in alphabetical order is easier), we want to use a space character to make sure the icon stays on top. The “View content as” option can be set to whatever you prefer. My preference goes to the “Grid” option – but you can select whatever you like best. To get you started, I’ve made some of the stack overlay icons available. I’m sure you can find more on the Internet, these just are some of my favorites. 1 – The default Apple Dock stack look – no overlay. 2 – Yasushi Chida’s stack overlays, as done by him in 2007. 3 – A set of very nice looking stack overlays done by fb4yc at DeviantArt. 4 – A cool wooden stack overlay by tomqq at DeviantArt. 5 – A generic but very nice gray transparent stack overlay by turnpaper at DeviantArt. As you can see … a good place to start looking for stack overlay icons is DeviantArt. I’m offering these files here just as a backup feature and highly recommend downloading the original files from DeviantArt. Unfortunately, Yasushi Chida’s website and his DeviantArt pages are either dead or empty, so I hope (with all respect for Yasushi Chida) it’s OK to offer the original files made by Yasushi Chida here. I’ve created a ZIP file for each of the sets – after downloading the ZIP file, unzip it to be able to access the icon files. After you unzipped the file (if you downloaded it here), find the icon you’d like to use and drag it in the directory you used for the stack. Make sure the filename of the icon starts with a space. So now that we know we need an icon file and where to get it, and that it’s filename should start with a space; time to add the icon to our example folder: Applications. 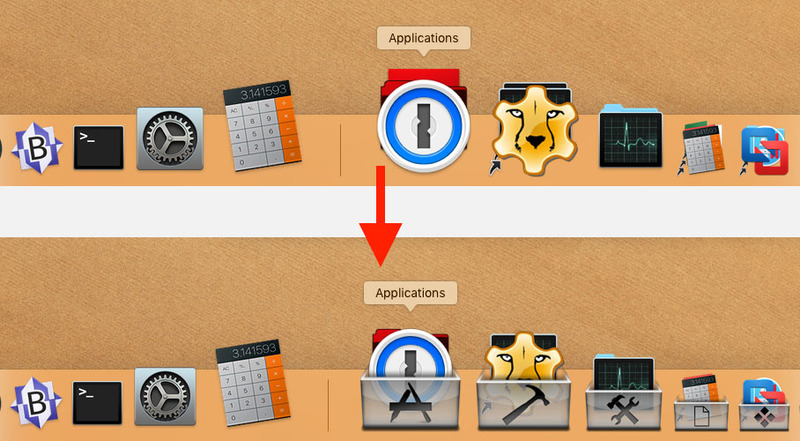 Find the icon you like and in Finder drag it into the “Applications” folder – and that’s all there is to it. Certain folders, for example the utilities folder in your Application folder, require you to authenticate when adding or removing a file – so this applies to icon files as well. This should not be a problem if this is your Mac, and you’re able to install applications. But if your account is not an admin account, this will not work for those folders. In that case you’ll have to ask, for example with an office Mac, an Admin to elevate your rights or have him/her copy the icon(s) for you. Removing the icon for the Stack Overlay is as simple as adding it. Simply grab the icon file and delete it (eg. drag the icon to the Trashcan). Please note that one possible downside of using Stack Overlay icons is that an icon file will reside in the folder – it’s harmless and can be ignored, but you will see the icon file in Finder when browsing this directory/folder. Now sometimes you may want to make a small group of applications for example for specific tasks. The best way to do this is by creating a folder in your home directory, or in the Documents directory, and make/move an alias of the application in that folder. Do NOT move an applications to other folders as this may cripple the application. Next add the newly created folder to your Dock and optionally place a Stack Overlay icon in it. Just what I was looking for. Great explanation, and finally found the files I could no longer find, since Yasushi’s website has been down for such a long time. Thanks John, for taking the time to write a Thank-You note – it’s very much appreciated! Glad this worked well for you as well! Just wanted to say thanks. I had seen these overlays before, just didn’t know how to use them. Awesome – thank you for posting a Thank You note – it’s much appreciated!